Like Edward Cullen in "Twilight", Nigel Mullet was transformed into a vampire when he was still a teenager, and will remain this age forever. 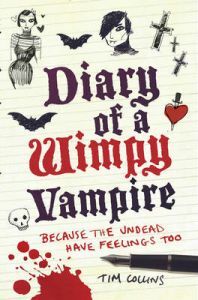 Unfortunately, Nigel became a vampire at the awkward age of fifteen, and must spend eternity coping with acne, a breaking voice, and an ineptitude with girls...In this, his excruciatingly funny diary, Nigel chronicles his increasingly desperate attempts to be noticed by the love of his life, Chloe Sparrow, the constant mortification caused by his vampire parents (not to mention the worry that they might accidentally eat one of his friends), and the frustration one feels when you've got the whole of boring eternity stretching out in front of you and you can't even have a lie-in (vampires don't sleep). Forced to hang out with the Goths and emo kids due to his pale skin and social awkwardness, and constantly battling his embarrassingly overwhelming desire to sink his fangs into Chloe's neck, will Nigel ever get his girl? Fantastically witty and hugely entertaining, this fun and accessible diary will appeal to anyone, teenage or otherwise...Winner of the Lincolnshire Young People's Book Award 2012.